A two-color globe that was recently offered on Ebay stirred up a lot of controversy. The globe was a red-over-clear globe marked "FRR" in cast letters, shown at right. The marking refers to the Fitchburg Railroad, an early New England predecessor of the Boston & Maine Railroad. The gentleman who offered the globe was a non-collector (at least of railroad items) who made an honest effort to determine the globe's authenticity. Due to conflicting opinions and controversy, he finally terminated the auction rather than sell a possibly fake item. This incident is a good example of the ambiguity that can occur when odd or unusual items appear on the market. If authentic, the globe is exceedingly rare and valuable. If counterfeit, it is a rather sophisticated example of the growing problem of railroadiana fakes. Without taking a position one way or the other, here are some arguments for and against the globe's authenticity. Unusual but authentic artifacts do surface occasionally, for example, one-of-a-kind salesman samples, test items produced by a new manufacturing technique, and rare items originally produced for specialized, custom purposes. Just because an item has not been previously seen by other collectors does not mean it is a fake. The consensus of experienced collectors is that there are no two-color globes with cast lettering. Rather lettering on two-color globes is either etched or cut. Other characteristics of the globe are suspect -- particularly the thickness of the glass and the size of the globe. According to one well-respected collector, "... the glass is thicker than any legitimate globe. 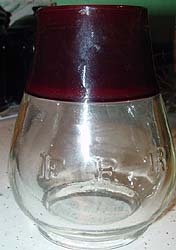 Also, red over clear globes were used in presentation lanterns, primarily to fire department members. They were also used by fire department chiefs or assistant chiefs so that they could be located at night at a fire scene. I can't imagine why the Fitchburg would need one. Finally, all the Fitchburg lanterns I have seen take an odd size globe. A standard 6"' globe will fit in a Fitchburg lantern but a Fitchburg globe is too large for a Dietz # 6 or other standard frame. " The globe was offered alone and not in a Fitchburg lantern frame; an accompanying matching frame would add to the globe's legitimacy. "I disagree on one point. I have had two 6 inch FRR clear cast globes and both were extremely thick and heavy. I kept the heaviest one, and it is by far the heaviest globe I have ever seen. There is no question that they were both authentic. I say that being thick and heavy is a point FOR rather than AGAINST." More information on Fitchburg globes including comments on the example shown here can be found on a separate web page on the Railroadiana Online Website. Note.Thanks to all who contributed to this page. The seller gave permission to use both the globe photo and his name, but all names have been left out here as unnecessary.